We know.. We know.. What's a mystery box? 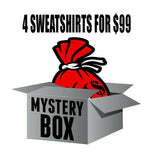 Mystery Boxes are 10 random different shirts from our line in the size you select. Our mystery boxes are generally used when we have too many of a design in one size or if it's the last few left in a particular design that's almost sold out. We'll add the last few pieces to our mystery box inventory and delete the item from our site to make room for our new designs. Once we have 10 different shirts in one size we'll make a box available to our online costumers at the crazy low price. So get yours while your size is available!